Home News A New Intermodal Station for Rochester, New York. A perspective view of the station looking northwest from Joseph Avenue. Here’s a view looking northeast from corner of Clinton and Central Avenues. Plan view of facility and surroundings. Tracks shown at top. Inner Loop at bottom. Plan view of facility (close up). 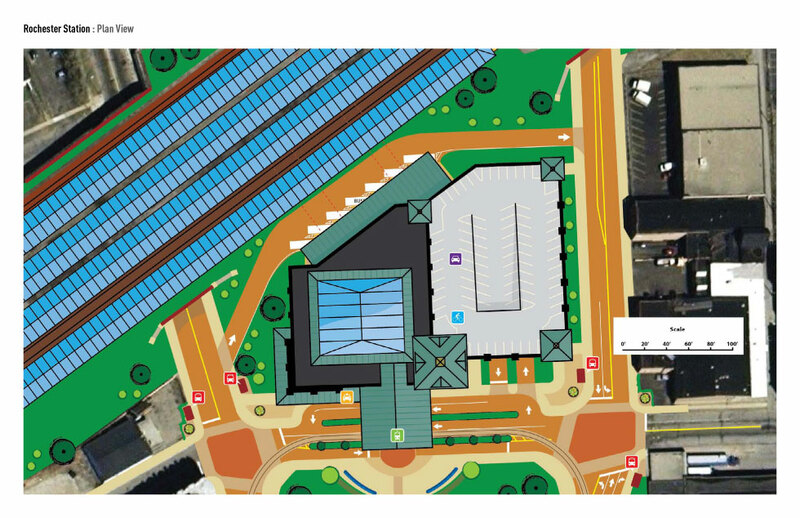 Plan view of facility (street level), Amtrak platforms, and tunnel. 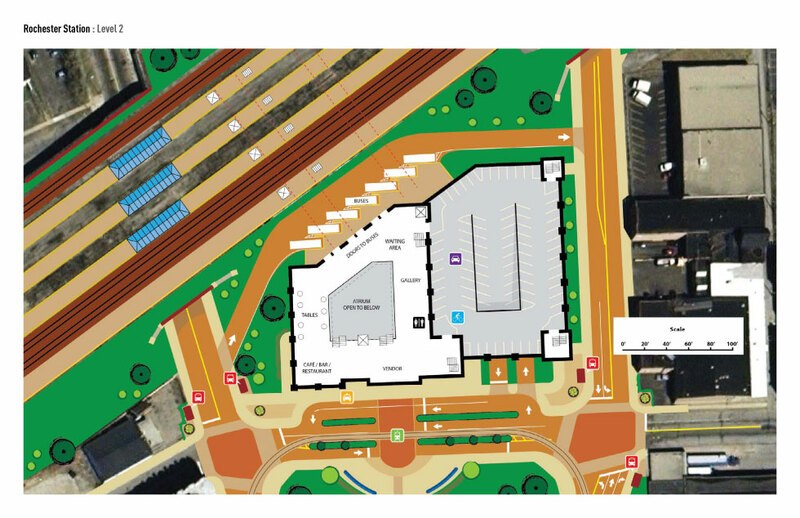 Plan view of facility (2nd level), Amtrak platforms, and Geyhound/Trailways platform. The majestic clock tower, reminiscent of Rochester’s older rail depots, can be seen from all directions – even from the north side of the tracks. Riders entering from out of town will know they’ve arrived in Rochester – and what time it was when they arrived! 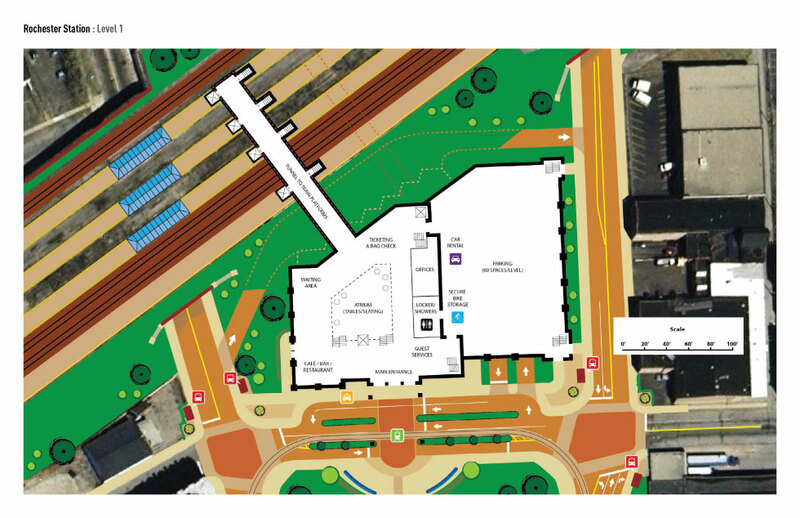 Provisions for safe pedestrian and bike access to and from the station including “exclusive phase” signals, diagonal crosswalks, ramps, wide sidewalks, and new period-style street lamps around the station and the square. The entire facility will of course be ADA compliant. Surface parking lots will be replaced with a two tier public parking garage with pedestrian access from station as well as from the street. Each level holds approximately 80 passenger vehicles. The old surface parking lot south of Central Avenue will be converted to an urban square. Add a grand fountain, some public art and you’ve got a prime spot for a picnic or just laying around. The City Circulator and shuttles will pick passengers up under the canopy and whisk them off to the RTS bus terminal, hotels, or other downtown locations. Travelers can pick up a rental car or a Zipcar® on the ground floor of the parking garage. Owners of electric vehicles can charge up at one of the multiple charging stations within the garage. Bike access to the station in accordance with the City’s Bike Master Plan. A separate entrance and amenities for cyclists such as bike racks, secure indoor storage, and shower/locker facilities. Passengers can relax and grab a bite to eat at the outdoor café. Then catch a taxi cab ride to their final destination. Taxis will wait for passengers from the dedicated curbside pickup/dropoff lane. Rail platforms will be accessible from the first level of the facility via the original Bragdon station tunnels. The tunnels will be refurbished with new tiles, handrails, LED lighting and elevators to the platforms. The original baggage tunnel will be retrofitted with new mechanicals that will carry passenger bags to and from the train platforms. Greyhound and Trailways buses will pick up and drop off passengers behind the facility (on the track side) at a covered platform. Passengers will access the bus platform from the second level of the facility. Buses will enter from Clinton Avenue and exit onto Joseph Avenue where they will proceed to the Inner Loop (I-490). The first level of the facility will accommodate guest services & info desk, offices, restrooms, family locker & shower room, ticketing & bag check, a café or restaurant (with indoor/outdoor seating), vending machines, waiting area with tables and seating, and the tunnel entrance to train platforms. The second level of the facility will accommodate food and gift vendors, an art/photo gallery, restrooms, waiting area, café tables, and doors to the bus platform. The second level will be accessible via two elevators and 4 sets of stairs. The entire facility and urban square will have public WiFi access. The site will be built and operated partially or fully under the guidelines of current “Green Building Energy Conservation Programs”. A three-story glass atrium will cast natural light onto both the upper and lower levels of the facility. Trees and other plantings will beautify the interior atrium year-round. Wind turbines and solar panels on the roof and in the square will partially or fully power the facility. Rainwater runoff from the facility and parking ramps will be mitigated with a collection system and holding tanks used to irrigate the square and surrounding landscape. The original platform canopies will be restored but will be dressed with a new colored glass roof. The railroad bridges over Clinton and Joseph Avenues will be repaired and painted. Skylights and LED lighting will be installed to light the roadway and sidewalks beneath. RTS bus shelters will be installed at the corners of Clinton and Central and Joseph and Central. Maps and schedules and real time digital signage will be available in the station for routes serving the station and for the RTS Terminal Shuttle. Real time digital signage will keep passengers informed of arrival and departure times in the facility and on the platforms. Announcements will be audible from anywhere within the station and in the parking garage and urban square. Wayfinding signage will be installed in and around the facility. And signage directing people to the station from points throughout the Rochester region will be updated. A major goal is to make it a pleasant experience for pedestrians to walk between the station and downtown. Trees will be planted all along Clinton and Joseph Avenues from the station into downtown. The gap between Clinton and Joseph Avenues (down into the Inner Loop) will be covered over with decking and landscaped. Crosswalks in the area will be widened and brightly painted (or laid in cobblestone), and traffic signaling will be reconfigured appropriately. Finally, the building itself will be viewed as a landmark, and a monument to the people of Rochester. The building will be open to the public 24/7/365. And at night colored lights will illuminate the facility from top to bottom including the train platforms. 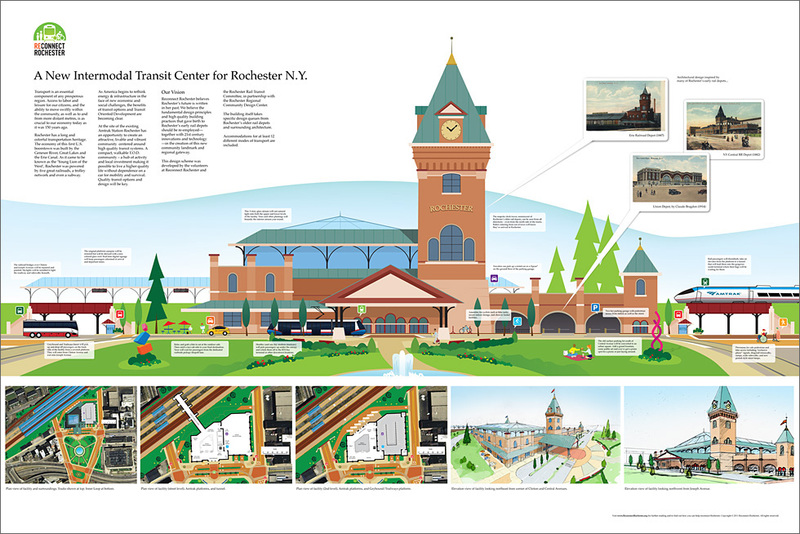 Many of the architectural and aesthetic decisions were inspired by Rochester’s great rail depots. Overall building personality… Albany-Rensselaer Station (built 2002). 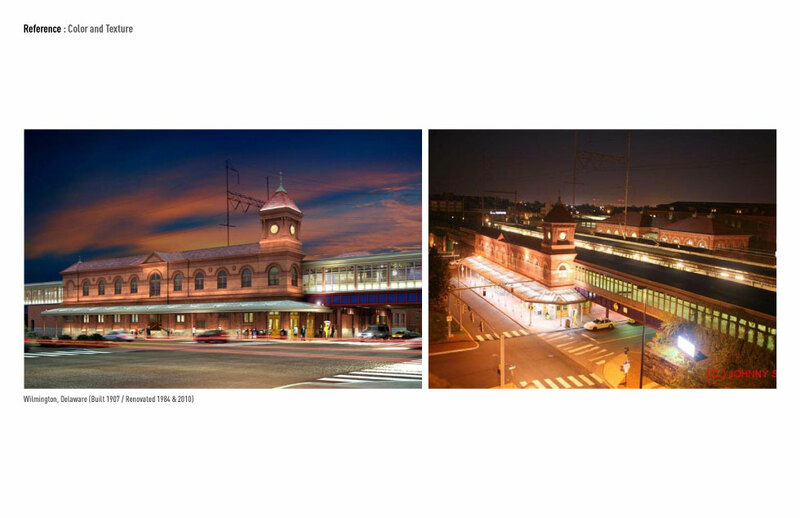 Color, texture, lighting… Wilmington Delaware Station (built 1907, renovated 1984 & 2010). 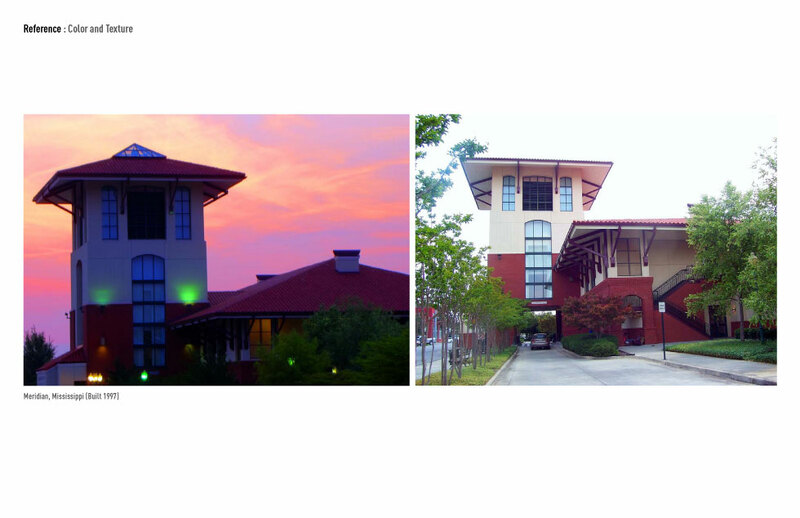 Color, texture, lighting… Meridian Mississippi Station (built 1997). 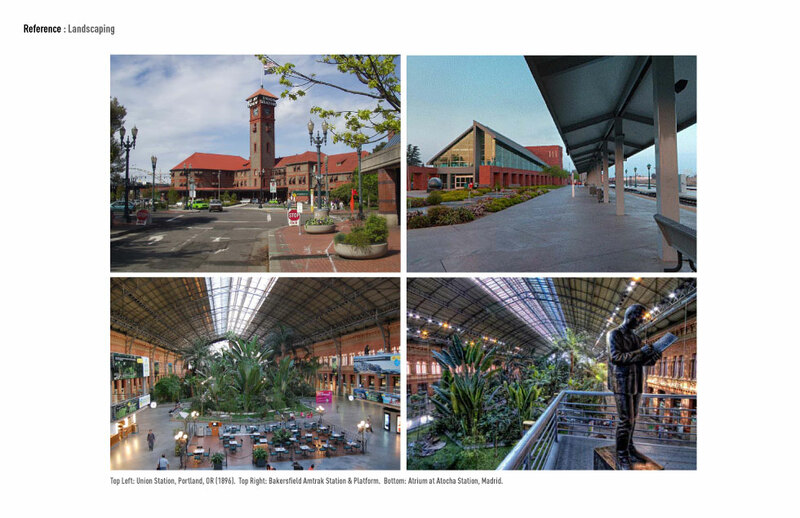 Landscaping… Top Left: Union Station, Portland, OR (1896). Top Right: Bakersfield Amtrak Station & Platform. Bottom: Atrium at Atocha Station, Madrid. 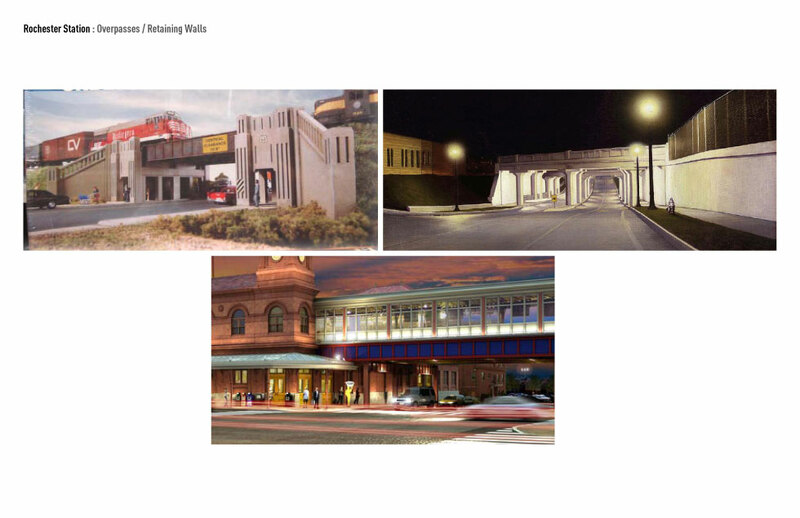 Blend of old and new… Top Left: Niagara Falls Station (planned). 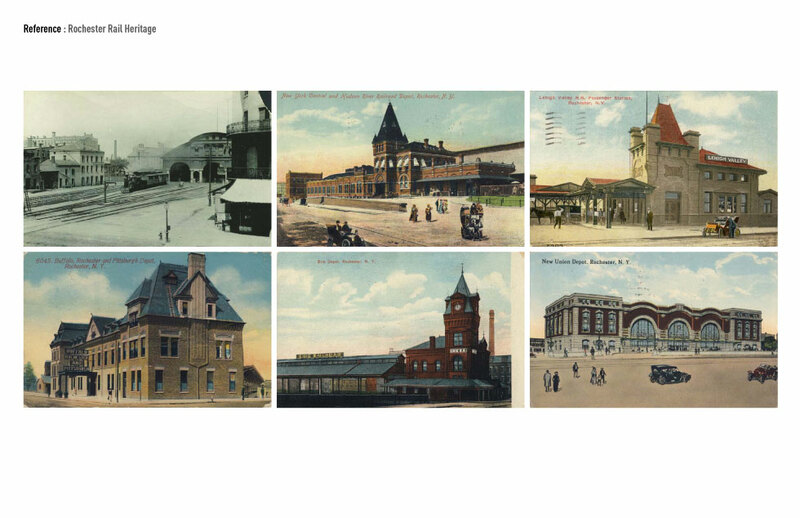 Bottom Left: Schenectady Station (planned). 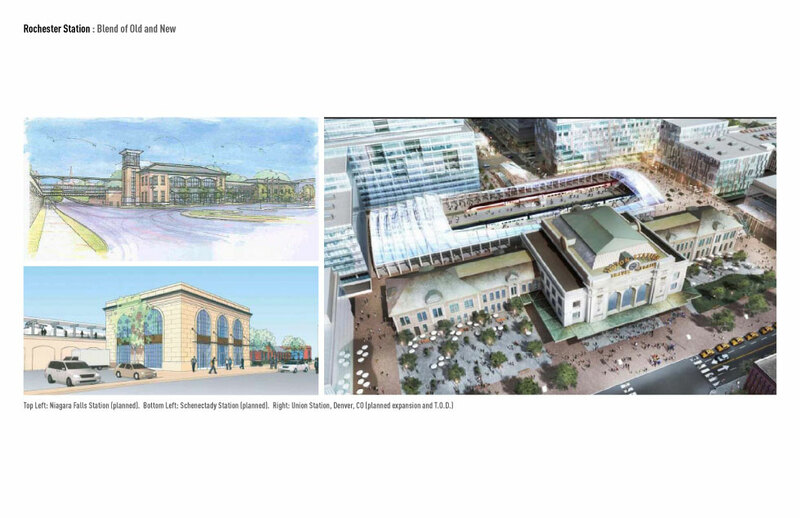 Right: Union Station, Denver, CO (planned expansion and T.O.D.). Gorgeous. I love that this solves complex logistical problems without sacrificing aesthetics. The design is a perfect tribute to train stations past, but with a fresh mix of modern features, openness and scale. Thank you for putting something thoughtful, grand, and worthy of Rochester on the table. It’s brilliant. Great Idea for the Rochester area! Glad to do it. We’re open to suggestions as well. Anything we’ve left out? Anything you’ve seen in other cities that might work well here? Let’s crowd-source. I can’t think of enough superlatives to describe your concept for our Intermodal Station. You seem to have thought of everything. Hopefully everyone will like it. How about showcasing local artists????? Rochester is blessed with a large number of talented artists both 2D and 3D. Why not find ways to exhibit local art/sculpture etc? Totally agree. We lumped that into a few of the key points (gallery and public art in the square) but I’d expand on that and say that opportunities for local artists to contribute to the building and the surroundings should be made plentiful! Actually, if you look at the illustration we included a few sculptures in the green space out front! This is the best news I’ve heard in years for downtown Rochester. Better than Paetec, Midtown, and Ren Square… Does this mean that they are putting a halt to the insane push for the Mortimer St. Bus station? This is the site I’ve been pushing for the downtown Rochester bus station. S’pose there’ll be room for a couple city buses, too? Too expensive. Not enough people transit by train, impractical! So exciting! I so hope that financing won’t be a problem. Our city has needed something like this for a very long time. Looking forward to updates. I needed to use the Syracuse intermodal last year. It’s OK, but not as nice as the Albany Train station, which I use with some regularity. One thing I don’t see is facilities for a cab waiting area. That’s something that both Syracuse and Albany have, and that travelers would definitely want. Is the tower currently being used for anything? If not, maybe it could be used for a children’s play area, which is currently not in the plan. You’d want more windows in it, though. Great ideas Bill. Albany is one we looked at. There is a cabbie waiting area right out front. Love the children’s play area idea. The tower currently has a staircase in it, but I’m sure space could be accommodated for a little gated kids area somewhere. We’ll make a note of that. We’ve had a few people ask offline about the style of architecture. I’m going to call it “modern-Romanesque”. We wanted a design that draws queues from some of the older stations but is clearly it’s own. Not a recreation of an older station, or a conglomeration. The clock tower, arches, decorative arcading, brick/stone work… these are all characteristics of Romanesque or more accurately Romanesque Revival. Union Depot (Bragdon) was not Romanesque. It was actually one-of-a-kind. Its fall to the wrecking ball was one of Rochester’s greatest blunders. And so we give the Bragdon station a nod in the form of those three iconic arches; the driving wheels of the locomotive as Claude Bragdon described them. But there could never be, and should never be, a do-over of that one. What a beautiful plan and a great website. What are the projected costs? Projected # of users? Would this help increase ridership? Why does the plan not include the Downtown Bus Barn? Just gorgeous! Obviously many hours of thought, research, and planning went into it. I would love to see this become a reality in our city! Wanted to put a word in for a companion/family restroom in your plans. I’m always so appreciative of these in public places now that my boys with special needs are young men with special needs and still require my assistance. Thank you so much, and thank you for your suggestion regarding the family restroom. We did include a family locker/shower room on our list (above). This room would also have a few toilet stalls. We are envisioning something like the family changing rooms at some of the new YMCA’s. All would be ADA compliant as it is required by law, but also because we want to see many families like yours using this station! As a matter of fact we have a meeting scheduled with the Center for Disability Rights to hear their ideas as well. And we’ll make sure to raise these points to the project planners. If you have specific suggestions feel free to list them here or send us an email. Thanks again! Looks incredible! I’d like to second the notion of featuring artists from the area, and I think that integrating student art would be a great way to show our appreciation for our city’s youth. On the flipside, I also support the type of collaboration Syracuse fostered with artist Steve Powers in order to beautify some of their overpasses…http://lovelettertosyracuse.com/ How about a love letter to Rochester?! Just wondering if this was passed along to City Hall and if so what they thought of it. My co-worker and I were looking at it (again) this morning and just loving the ideas around this. I have many friends who live in the NYC area and we would love a better train station for our travels. This concept was hand delivered to the City Planning office. We have also heard (from sources very close to the project) that our ideas DID inspire several of the design firms who responded to the RFP. However, we do not know if the chosen firm (Bergmann Associates) was influenced by any of our ideas. We are hopeful. An outdoor cafe is great, but for a city that is covered in snow for 4 months out of the year, are there any plans for indoor dining facilities? This could be a great venue for a local entrepreneur like Boulder Coffee / Java Joes. Also, the plans are absolutely gorgeous and as someone who takes the train several times a year for long distance travel, I will be happy to see this station be built. The current station is dismal, dank and reeks of stale cigarette smoke and broken dreams. Sarah, thanks for the comments. To answer your question, YES. Click on the floor plans above and you’ll see “Cafe/Bar/Restaurant” with tables/seating on both 1st and 2nd levels. The type is small but we’ve covered the bases. We still need to add that kids play area though. But please clarify – is this IN PLACE of the controversial Mortimer Street Bus Barn or completely independent planning? To answer your question, we would have loved to have the opportunity to draw up a plan for one facility that would accommodate all this plus RTS. But it is not to be. The Mortimer Street Bus Terminal plans were just too far along for us to be able to influence. We tried. So instead we’ve included room in our plan for a shuttle or streetcar circulator to move people between these two separate facilities. We’ve also addressed the RTS bus stops which are immediately adjacent to this Amtrak facility. We’ve moved a few them closer to the building, and called for new bus shelters and several considerations for pedestrians. RTS information, digital signage, and ticket purchasing should also be included within the facility. Cool. Thanks for the response. Do you know the latest on the Mortimer Street Bus Barn? Have they broken ground? The schedule called for groundbreaking this Fall. Not sure if there’s been any activity down there as of yet. I love trains and have been riding Amtrak for as much of my business and pleasure as I can. I remember where I was standing in my house when my father showed me the photo of the New York Central Station the day the wreckers destroyed it. I believe the vulgarian responsible for the outrage was a developer living in Florida. Downtown was not the same since. What you have done here shows imagination, vision, and confidence in the future of mass transit and of Rochester. Let’s go for it, AND let’s get a light rail shuttle going between this station and the Mortimer St bus terminal. From that shuttle, we can build an efficient downtown circulating trolley. What is the status of this plan now (5 November 2011)? What opposition do we face and how are we faring facing it? How public is this plan, i.e., how many of the 1.1 million people in our greater metropolitan area know about it? And most important, do we have the financial backing to see it through? Inasmuch as I would like to see the current Amtrak station replaced, I would like to remind everyone what it replaced. Two-thirds of Claude Bragdon’s building was destroyed; only the western third was left to function as the station. As time went on, that piece was boarded up, and passenger waiting and ticketing were moved inside the tunnel leading to the platforms, though only one platform was used. The tunnel leaked, the benches were filthy with pigeons, and the whole thing was so unsafe that Amtrak threatened to pull out because so many passengers were robbed at knife and gunpoint. The city had to keep an on-duty cop there. That is when the current station was built, and it was so designed that it could be easily converted to what you propose here; e.g., the Bradgon platform tunnels. You don’t need to RSVP but it would help us get the word out. Please share this event with your network. See you there! But as asked above, where exactly are we in this process? It’s very confusing. @Adam, Bergmann Associates and the City are conducting a scoping study. The study will determine where the facility will be, what should be included, who will operate it, how much it will cost, etc. This upcoming open house will be the first opportunity for the public to comment on initial findings and give input on the vision for the new station. I love the plan. There is definitely a need to replace the current and this seems like the perfect thing to do it. I do have one issue with it, and that is the re-use of the underground tunnels. Though I’m not aware of any particular reasons for this (though I assume they’re cost savings and convenience) it seems that most stations seem to be trending towards bridges instead of tunnels. It seems to me that, as has been seen previously, it is all to easy for tunnels to become very dangerous. Just my two cents. 2. Simplicity. Both from a design and engineering standpoint, and for the passenger. The elevation change from the street to the train platforms would require a bridge to built 3-4 stories above street level in order to traverse the tracks. We think this could prove to be an inconvenience, since passengers would be required to take two elevator rides; one up to the bridge, and one back down to the platform. Either way you’d be traveling through a tunnel. Whether it’s above or below the tracks. We feel safety concerns can be addressed. You may be interested to know that official preliminary drawings do show a bridge over the tracks. Check out the drawings here… http://bit.ly/tewNKJ and keep an eye out for the next public input meeting which should be coming up this Spring. Where will the funding for this project come from? Amtrak faces its greatest threat from Congress in its 40 plus years of existence. 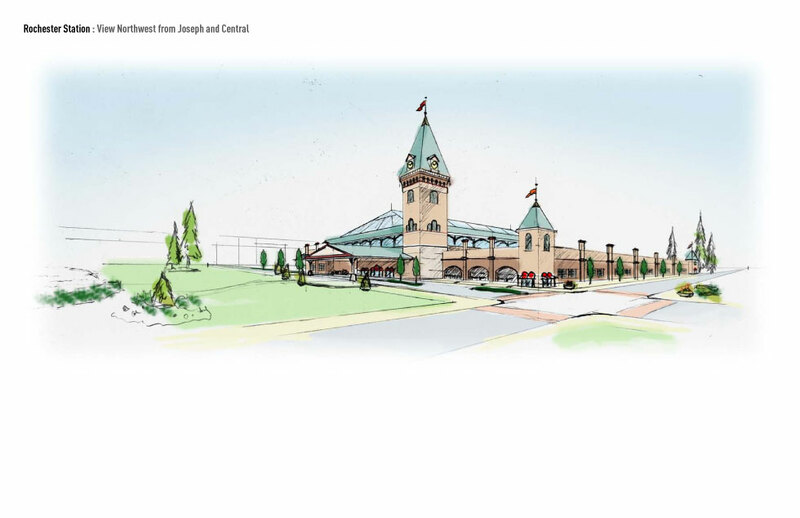 Is Amtrak funding the construction of the new intermodal Rochester station, or are monies coming from elsewhere. I would like to use this opportunity to tell everyone interested in Reconnect Rochester to communicate with their representative and senators not to cut Amtrak funding. In fact, people viewing this website might be interested in joining the National Association of Railroad Passengers (=NARP), an organization that promotes not only intercity rail but also lightrail within cities and metropolitan areas. I just arrived today at the Rochester Amtrak station expecting to see some movement on the new intermodal station. There did not seem to be anything going on, not even signs indicating that a new structure was being planned, even though the website mentions construction in 2012. Does anyone know the date when we can expect the City to break ground for this project? 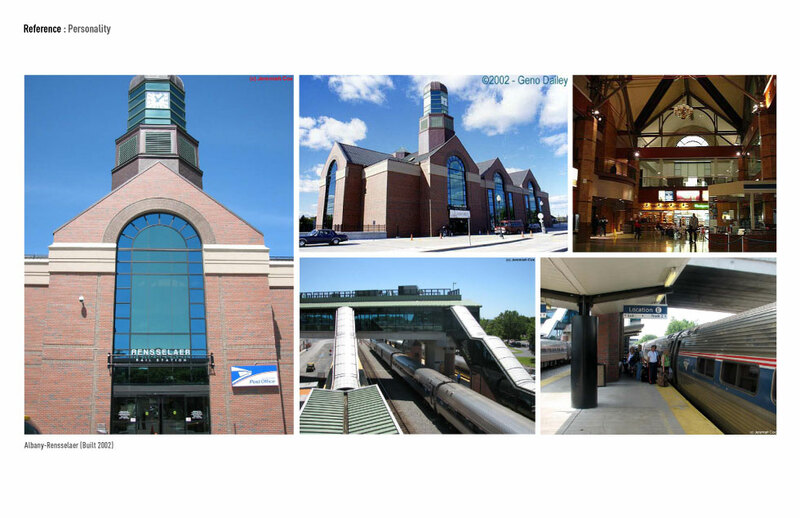 Pingback: RECONNECT ROCHESTER » Rochester Intermodal Rail Station Update ...Go Transit! Why is this design NOT being considered?! It’s much more attractive and exciting then what’s been presented by the City of Rochester recently! You’re only gonna get ONE shot at this! @Al, thank you for your passion! You should definitely send your comments to Thomas Hack… hackt@cityofrochester.org or 428-6852. While the scaled-back design is disappointing, we can still do a lot with it. The second option of tucking the parking lot behind the station is a very good move. The cost is nil, but the dividends in aesthetics are great. This station must connect with the downtown landscape, and an open parking lot dominating every line of vision from the street will destroy such a connection. It is better to de-emphasize it. Train stations were often constructed as the gateway to the city, and they still function that way. Union Station in Washington, 30th Street Station in Philadelphia, and Grand Central in NYC are good examples. We must also keep in mind, therefore, that there actually will be two front doors to our station at opposite ends to each other. From the street and from downtown, the front door should welcome passengers to a comfortable journey as they say good-bye to friends and family. Simultaneously, what we consider the back side of the station is also a front door to those detraining. It should welcome all to the city and the region. People staying on the train will also see the facility, and we want them to have a good thought when the train pulls out; it is good advertising for the city and the region. To do this, the station must be visually pleasing and welcoming from trackside and not look like a warehouse dock. Moreover, if the parking lot will be visible from the train, it should have berms with low vegetation and environmentally friendly lighting. Let everyone know that Rochester is the Flower City. The bus terminal will also be visible from the street and track. It would be great if its loading bays could match the roofing used on the train platforms for greater unity in design. I was not able to attend the meeting last week. How did it go and when do we break ground? 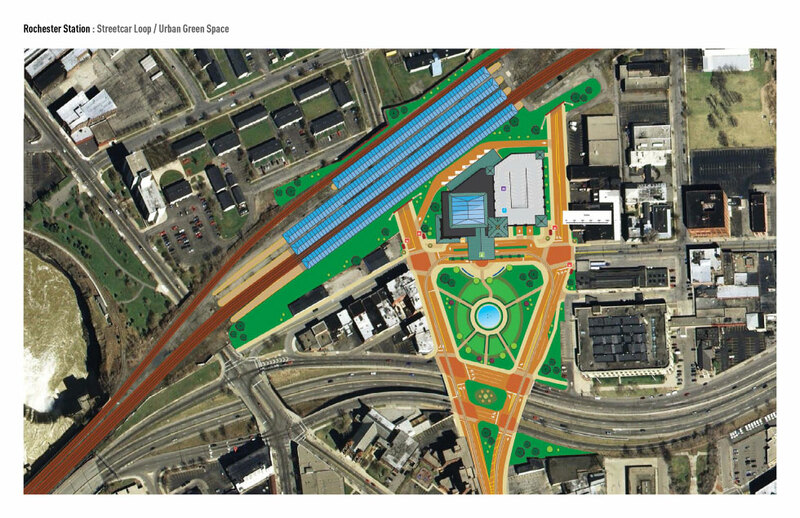 I just commented on the blog by Andreas Rau on the D&C today about the new intermodal station plans. I am disgusted with the new plans put out by the City of Rochester! It is totally lame! They can give Wilmot a $22 MILLION tax exemption for the Sibley building…but they can’t give Rochesterians a DECENT TRAIN STATION?! When is the next public meeting?! Recent checked out some Amtrak Twitter sharing, the little snippet about Amtrak security dog teams playing a critical role, aiding in helping USA rail passenger system users, get to their points of destination safely. These K9’s and their well trained human handlers, deserve sincere thanks and traveler support. So, if you’ve secured yourself, a discounted train ticket, well done, but your AMTRAK train travel experience is, always, a serious “top dollar” committed effort, from the experts, including the four legged members, behind the scenes, sniffing away, hard at work! I live out of town, but I am very interested in railroad operations, especially Amtrak in NYS. 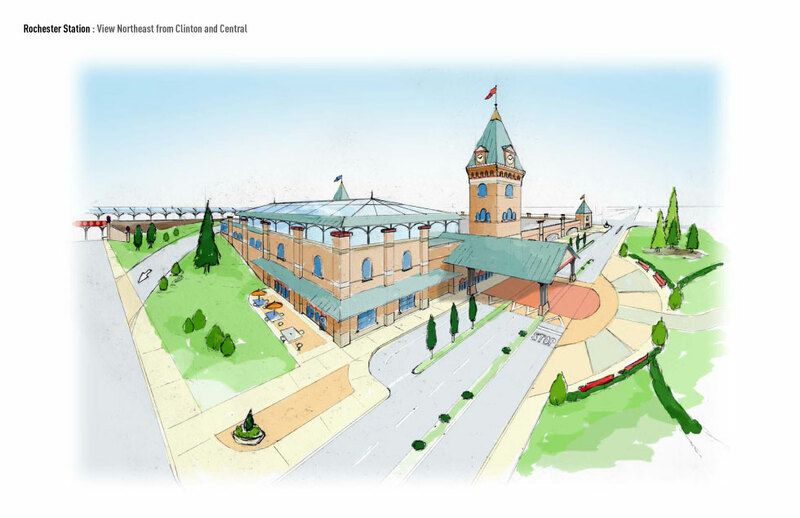 What is the status of the new Amtrak station in Rochester? Has a date been set for its dedication, and will the intercity buses be included in the same facility?